This contemporary house on the Isle of Skye was designed from the inside-out to include built-in bookshelves and picture windows on the upper floors. Designing a house is a complicated process and there are lots of options to consider. Most important is that you are happy with the design, both inside and out. Here are twenty questions you should always ask yourself before planning the design for your dream home, including everything from design and budget to landscaping and exterior. What are you hoping to achieve in your new home? Examine your own motivation for self-building. Is this the culmination of a long standing desire to create something permanent that you can be proud of which will be there long after youre gone, or is this merely a step on the ladder to your eventual dream home? Are you doing this in order to have a home that fits your’s and your family’s lifestyle and individual needs, or are you more interested in the possible gains in equity that are there to be made? Is it all about larger accommodation, particularly more bedrooms, or is it about quality? 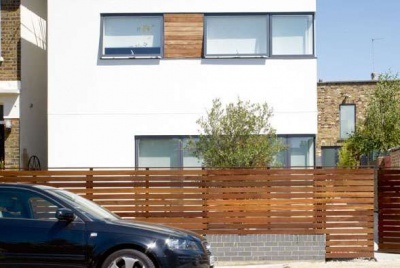 Is kerb appeal and instant attraction more important than having a home that grows on you or opens up in unexpected ways when you walk through it? Have you properly considered the budget? The budget is the most important piece of the design jigsaw. Have you worked out your finances and deduced just how much you can afford to spend on your new home? Are you aware that differing methods of building and the level of your own involvement with the build process will impact on the costs and therefore the proposed size of your new home? Are you going to go right up to or even slightly beyond the limit of your finances and trust to inflation sorting out any shortfall or are you going to play it safe? Have you considered whether a contingency sum would be appropriate for cost overruns? Have you put budget at the top of the requirements list that you will eventually be presenting to your architects/designers? Are limited finances affecting your desired achievements? If the plot is more expensive than you had hoped for and this has seriously eroded your ability to build what you wanted, could you look at things another way? Is it possible that you could think in terms of a design that could be built in stages or one that could evolve as finances permitted in the future? Would it be possible to scale down your requirements? Could you cheapen the specification in some ways in order to gain more space on the understanding that at some time in the future you could strip certain things out and put better ones in their place? 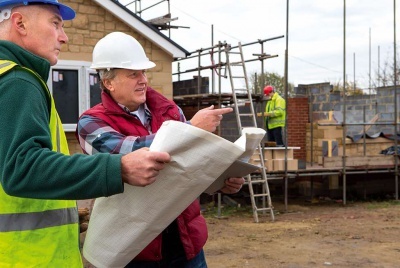 Could you think in terms of managing subcontractors for all or some of the trades rather than paying a higher price for a builder? Could you undertake one or more of the trades yourself? How long are you likely to live in the new property? A home might not be for life but it should be capable of evolving and adapting to changing needs. If you are going to be in the same house whilst you raise your children will you need to think ahead for their accommodation requirements and the maintenance of your own sanity? What about visitors? Do you have family or friends who will often want to visit and if so do you have to design around the ability to put them up with relative comfort? If you opt for all of this extra accommodation, what use will it have when the family has left home? If you’re planning to live in the home through to old age should you make adjustments to the design to accommodate ground floor living/sleeping or the possibility of physical disability in later life? Could part of the building provide either a granny annex or accommodation for a carer? Have you examined your motives? Are you aware of the need to save money in the short as well as the longer term? Are you conscious of the fact that in later life your finances might be limited and that being saddled with high fuel costs might make your staying in the home untenable? Are your motives purely personal or are you trying to save the earth? Are you aware of the fact that many of the energy saving devices and technologies have very high capital costs and that you might never recover these? Have you considered which relatively cheap ideas could lower your running costs and pay for themselves within a reasonable timescale? What sort of living accommodation do you want? Do you dare think in terms of open plan or is your requirement for open plan living part of the reasoning behind you wanting to self-build in the first place? If you stick to convention, will a large lounge be used by the whole family? If there is a snug, will it ever get used? Will that usage continue or will the need for the children to have separate space where they can watch and listen to their own choice of TV and music become apparent in years to come? Do you need family rooms, music rooms or television rooms? Do you need a study or an office? Could you think in terms of the various living rooms being interconnected or even capable of being opened up to each other? Can you incorporate the garden into the home? The garden should be an extension of the living space within the home rather than a separate entity and, weather permitting, it should fit into the natural progression between rooms. Can your access be via a sunroom or conservatory? Which rooms do you want to have direct access to the garden? Are you worried about children and dogs bringing in dirt? In bad weather could the garden be brought into the home by means of raising flowerbeds and planting so that the eye is led through the window and beyond? Will the access be suitable for older people rather than serving to exclude them from the garden? Does the house design reflect the need for direct access between the garden and the street, negating the need for plants, mud and other garden materials to be brought through the living space? Internally could you go for freedom of expression? The internal arrangements of most homes are remarkably predictable with a recognised progression of associated rooms. Do you feel the need to stick to conventional design formats? Does each area of your new home have to justify its existence by reference to a particular function or could you contemplate the idea of architectural space for its own sake? Could you envisage a layout or mixture of rooms that defied the accepted wisdom, yet fitted in with your own lifestyle, or would that seriously affect any resale values? Do you care? Do you want a strict division of living and sleeping arrangements? Do you want to create areas of your new home that are private from or even capable of being divided from other areas? Could/should you plan to occupy the attic? 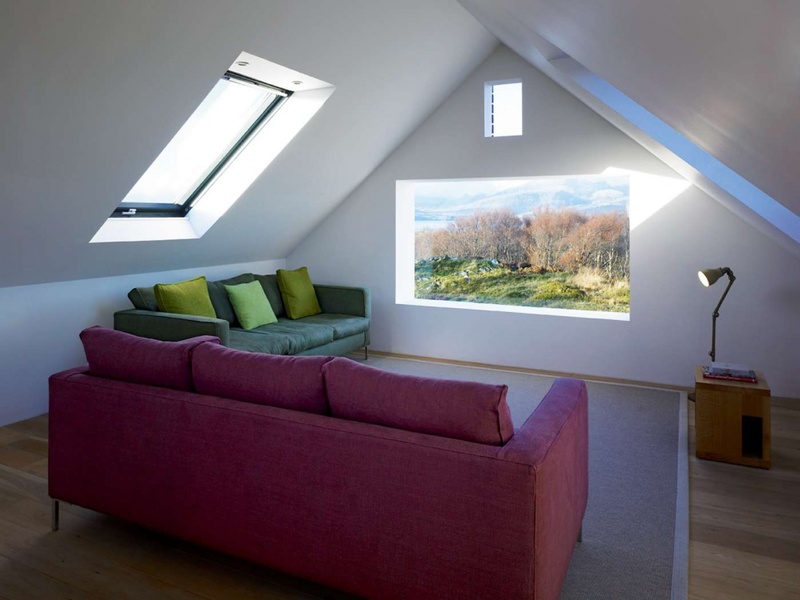 Attic space is cheap space but its use or eventual use has to be planned for. You cannot start cutting up ordinary roof trusses and you will have to think in terms of attic trusses or a purlin and spar roof. What will you use your attic for? Will it be additional bedrooms or bathrooms? Will it be office space and if so can you get heavy office machinery and equipment up there? Will it be used as a play area? If so what are the implications for bedrooms immediately below? How will you gain access? Are you content for an occasionally used room to have access via a pull down staircase or loft ladder? If you want a permanent second staircase, is there room for its departure and arrival and is there sufficient headroom? Will the addition of a further habitable floor mean that fire regulations make you use fire doors to all doors leading from the landings? Externally, what do you want it to look like? It is a sad fact that external appearance is often, to a large extent, governed by the planners and the general concensus that new homes should fit in with the local vernacular. Do you want to try to push the boat out in design terms? Are you ready for the extra work and cost that that could entail and are you also ready for the possibility that any departure from the norm might affect your chances of resale? Most self-builders stick to convention when it comes to design and almost all copy the houses of the developers that they purport to despise. Are you ready to buck that trend? Will your site lend itself to new innovations and design ideas or is this the wrong place or period of your life to buck the trend or conduct experiments of that sort? Considered almost essential by the market, yet very rarely used for the housing of motor cars. Do you want one at all and if so, will you ever use it and what for? Could you think in terms of building more house or could you think in terms of incorporating the garage space within the home on the understanding that if it ever comes to resale, it can be put back to its original purpose? Could you have a carport instead? Should the garage be attached, integral or detached? 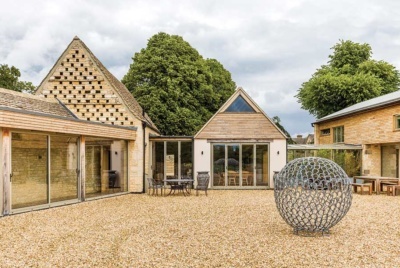 Planners feel that detached garages reflect the rural character whilst attached and integral garages are an urban solution to the problem of what to do with the motor car. If the garage is detached or attached to the side of your new home, could it be left until later so as to concentrate available monies on the actual home? mud room, somewhere for dirty dogs and wellies, could it really just be a lobby and could it benefit from a toilet and/or shower room? If space is at a premium, could the utility room be scrapped altogether in favour of a bigger kitchen or a breakfast area? If you are having underfloor central heating have you thought of where the necessary manifold cupboards will go? Is there to be space for a central vacuum? Will the linen or airing cupboards be accessible to the communal areas or must they be in one of the bathrooms or bedrooms? Have you already got wardrobes or will you want built in and fitted ones? Have you made a list of your favourite furniture? Most modern furniture is designed to fit through door openings as narrow as 760mm or else be capable of disassembly but antique furniture certainly is not. Is the dining area large enough to accommodate your dining table at its full extension and is there room enough around it for chairs and circulation? Are the ceilings going to be high enough for antique wardrobes? If your snooker table is going in the loft, can you get it up there and if so, will the floor be able to support it? Is there enough space to use it without restriction? A snooker or pool table needs at least 2m all around. In many homes the dining room is the least used yet most expensively furnished room in the house. Do you really need it? When you say that you couldn’t have guests eating in the same area as the food preparation, are you thinking clearly? Who do you have to dinner? Do you really have strangers to dinner or are they normally family or friends? Do you really entertain thoughts of having your boss for dinner or is it more likely that in those circumstances you would eat out? What about a kitchen dining room or an archway between the two areas? At least the cook would not have to be excluded from the dinner party. Kitchens are one of the biggest selling points. Is yours the right kitchen for your home? Have you chosen from the brochure or for fashions sake without thinking how it will look in your home without showroom lighting? Would a breakfast area be a useful and much used space? Will the selection of certain external materials impact on your design? The choice of external materials is dictated, in many cases, by the requirements of the local authority. Do you understand that if you are building in materials such as natural stone this may well affect the design of your new home and as the walls will be thicker, you could be losing useable area? Certain bricks, tiles and stone are no longer available and alternatives can be very expensive. Could you use the argument that modern buildings can empathise with traditional architecture whilst making their own statement in terms of design and the choice of building materials? Are you aware that some roof coverings have to be laid at either a minimum or maximum pitch and that this can affect not only the design, but also the availability of loft space? In most conventional designs the method of construction is secondary to the design. Certain specific construction forms do, however, facilitate or in some cases dictate the design. Are you sure that the construction method you favour will be able to provide you with what you want in design terms? Are you aware that to add in a fireplace to some of the sealed home systems might negate much of their energy saving concept? Do you realise that some of the post and beam systems can provide clear open space that would otherwise be unattainable? Have you thought that open spaces and high or vaulted ceilings will require specific heating solutions if you are to maintain the same level of comfort as in other areas? Have you thought of running costs? Have you considered what the full height glass wall will be like in summer as well as winter? Do you need a downstairs toilet by the front door or would it be more useful in the utility area or accessible from the garden? Might you not need both? An en suite is de rigeur in most larger family homes and an important factor when it comes to resale value. Do you want it to be a shower room or a full bathroom? With the communal bathroom do you want the toilet to be separate or have you thought of a completely separate toilet in any case? What about en suite accommodation for other bedrooms, or for at least one that you can call a guest suite? Could the idea of one bathroom being directly accessible to and serving two bedrooms fit in with your family arrangements? Have you thought through the family routines, especially in the mornings? Would doubling up the number of hand basins help? Could you put hand basins in some bedrooms? What about the number of bedrooms? You might only want two or three bedrooms, but adding that extra room to the design takes you into a completely different price bracket. A house with three large bedrooms compared against an identically sized house with four smaller ones might have considerably less value, yet its build costs might be substantially the same. Could you plan for larger rooms to be sub-divided and if you sell on do you understand that it might be better for you to effect the change rather than relying on a prospective purchasers imagination? What about sizes? It is your house so are you going to insist that the master suite takes the lions share of the space? Will you want dressing rooms? Do you want the remaining bedrooms to be more or less equal in size or could one or more of them be smaller and given over to occasional or some other use? Should you think in terms of incorporating a basement? Does the slope on your site dictate a split level or partial basement design as the cost effective design solution? If there is a planning restriction on the overall size of the building, will the planners agree the basement as an extra or will they count it as part of the allowable area or volume? Would it be extra living accommodation, play space or a utility room? Can you provide windows at a higher level or consider lightwells? If it is going to be windowless, have you considered ventilation adequate to its proposed usage? Are the soil conditions right for the building of basements in your area? Will you think in terms of a fully tanked basement or might you opt for one of the sump and pump systems? Are you aware that the space will cost as much to build as the rest of the house? Could the hall be given greater prominence? 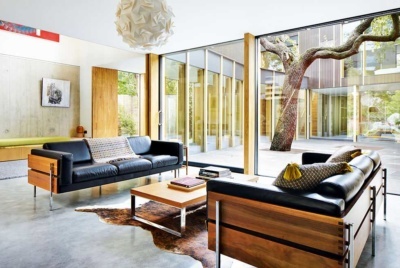 The entrance hall is the window into the rest of the home. Too pokey and it gives a first impression of a cramped and often untidy space; too big and it begs the question, could this space have been better employed? Could it indeed have some useful function other than just as an entrance and passageway? What about all or part of the hallway becoming a dining hall or great room? What about the idea of the hall doubling up as a communal sitting area? What about scrapping the idea of a hallway entirely and making the entrance through a conservatory or atrium or even directly into one of the living rooms? Does the staircase to the upper part have to go from the hall? Could you think in terms of the staircase being enclosed or off another room or is the staircase itself part of the statement you want to make about your home?